Hathaway-Sycamores Child and Family Services, a Pasadena-headquartered nonprofit organization that provides a comprehensive continuum of therapeutic and other support services to thousands of children and families in the San Gabriel Valley, is asking caring members of the community to help brighten the holidays for the youngsters they serve. 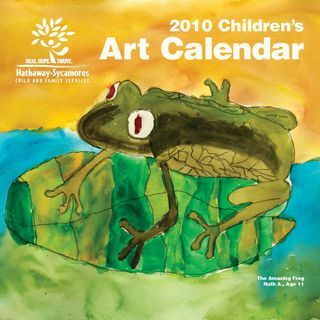 • Buy a Hathaway-Sycamores 2010 Children's Art Calendar—Created by youngsters receiving support services from Hathaway-Sycamores' Highland Park Resource Center, this colorful calendar is testimony to the healing power of artistic avenues. To purchase a calendar ($10, plus $5 shipping and handling), contact Andi Sica at (626) 395-7100 ext. 2516 or e-mail at andreasica@hathaway-sycamores.org. • Donate gifts—Gifts should be unwrapped, nonviolent, and appropriate for children from 0 to 18 years old. Gift certificates—particularly for music, clothes, movies, and sporting goods—are also welcomed. Gift donations can be dropped off at Hathaway-Sycamores' Pasadena offices, 210 S. De Lacey Ave., Suite 110, Pasadena, CA, 91105. • Host a "Wish Tree"—This is an opportunity for area businesses. Hathaway-Sycamores provides paper ornaments on which are written the names of children in residential treatment, their age, and what they would like for a gift. The ornaments are hung on a tree, and employees can then select an ornament and fulfill that youngster's wish. Hathaway-Sycamores will pick up the gifts prior to the holidays. Businesses interested in participating should contact Andi Sica at (626) 395-7100 ext. 2516 or e-mail at andreasica@hathaway-sycamores.org. • Adopt a family—Among the families receiving services from Hathaway-Sycamores, the agency has identified those most in need. Community members can "adopt" one of these families by providing gifts and food for the holidays. Contact Andi Sica at (626) 395-7100 ext. 2516 or e-mail at andreasica@hathaway-sycamores.org. • Shop at Vroman's Bookstore—Visit Vroman's Bookstore at 695 E. Colorado Blvd. in Pasadena or shop online at www.vromansbookstore.com. If you designate Hathaway-Sycamores as your “Vroman's Gives Back” organization, Vroman's will donate a percentage of your total purchase to the agency. • Purchase holiday cards—Wonderful holiday cards, created by children receiving services from Hathaway-Sycamores, are available online at www.zazzle.com. A percentage of every purchase goes directly to the organization. • Make an end-of-year donation—Support child in need by making a tax-deductible donation to Hathaway-Sycamores. Donate securely online at www.hathaway-sycamores.org, or mail donations to Hathaway-Sycamores Child and Family Services, 210 S. De Lacey Ave., Suite 110, Pasadena, CA, 91105. Hathaway-Sycamores Child and Family Services, one of the largest, nonprofit, private children’s mental health and welfare agencies in Los Angeles County, provides a comprehensive continuum of services to more than 11,000 children and families annually through a network of facilities stretching across the greater Los Angeles area including the San Fernando Valley, San Gabriel Valley, and the Antelope Valley. Services include: a residential treatment center for youth ages 6 through 18; foster care and adoption services; a nonpublic school; school-based and outpatient mental health services; wraparound and in-home counseling services; a transitional living program for teens; a family resource center; and a grief and loss center for children. The agency is licensed by the California Department of Social Services, certified by the Los Angeles Department of Mental Health, and accredited through The Joint Commission. To learn more about the organization go to www.hathaway-sycamores.org.